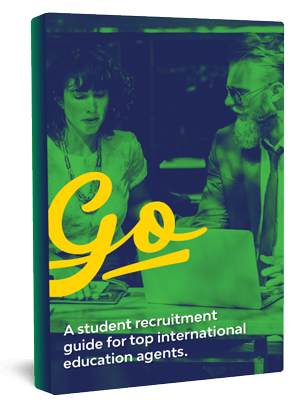 A student recruitment guide for top international education agents. Simply enter your details below for your free student recruitment guide. Life as an agent can get hectic at times. There are so many students counting on you for a simple and successful transition into their international study experience. With so many students seeking out the support of agents, student relationship management is crucial. Not only do you need to build strong connections, you need to be able to manage critical information at high volumes. The good news is, managing these relationships can be done successfully with the right tools and tips. Manage your student relationships the better way. Good relationship management is the foundation for any education agent’s success. However, it’s not always easy. Luckily, Cohort Go is out to change that. With the only comprehensive software that encompasses payments, management tools and supplementary services specifically tailored to the international education market, the Cohort Go platform gives you the resources you need to ensure your student relationships thrive. How can you build stronger student connections? While our platform can facilitate stronger relationships, it takes more than just technology to build strong connections with students. Real bonds are the result of personal interactions, insightful conversations and trust-building processes. We know just how important your role is in an international student’s journey. Cohort Go has helped more than 2,000 education agents and providers and over 80,000 students from 180 countries. This eBook will provide you with the top tips and tools to build long-lasting relationships with every overseas student that walks through your door. Start managing your students the better way, download our eBook today!